Even by Vienna standards, the Justizpalast is ridiculously pompous: As if it was the result of a competition on who is going to build something with the most references to antiquity per square metre. Cesar′s Palace in Las Vegas is more tasteful than the Justizpalast. It was built by the historicist "architect" Alexander Wielemans von Monteforte - his name echoing the pathos of his architecture. The most famous part of the Justizpalast is probably the central entrance hall, which was modelled after Baroque ideals and has a massive wooden staircase and heraldic references to all the "Kronländer" of the Habsburgs - essentially their provinces. Despite of common misbelieve, the ministry of justice does not live in there anymore. The building of the Justizpalast is historically very important, though. In 1927, a group of conservative paramilitaries overreacted at a socialist demonstration in the village of Schattendorf in the Burgenland. They shot two people, one of them was an 8-year-old child. The culprits became icons for the conservatives and nationalist groups and when they were found not guilty by the court in the Justizpalast. This decision resulted in violent riots in Vienna and other towns in Austria and preceded the much more severe fights between social democrats and conservative groups that followed in 1934. The riots of July 1927 were so severe that the Justizpalast was set on fire and looted; 84 demonstrators and four policemen were killed. The damage on the building was quite severe, too, but could be fixed within a relatively short amount of time. In the course of the refurbishment, the Justizpalast was also topped up with an additional floor. Despite of some minor damage that the building suffered again in WWII, it became the allies' shared headquarter in the occupied Vienna between 1945 and 1955. Today - and since the allies have left - the Justizpalast serves its original purpose: It is home to the "Oberster Gerichtshof" (supreme court of justice), the "Oberlandesgericht" (Vienna′s highest court), the Oberstaatsanwaltschaft (the highest council of prosecution / attorneys), and the Generalprokuratur (sort of the prosecutors or attorneys of the supreme court). 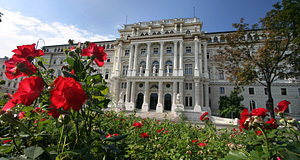 Since the Justizpalast is often the venue for important court sessions and trials, it receives a lot of media attention and is well-known in Austria. In terms of style - if this is the right word to use when referring to the Justizpalast - it is neo-Renaissance in combination with some neo-Classical pomposity; this includes two lion statues at the entrance, a pillar-decorated front façade and massive stairs. The building was recently renovated and now looks all nice and shiny. It is best enjoyed from the small park in front of it, the Schmerlingplatz, which ranks among Vienna′s most popular deposit grounds for dog faeces - so watch out in case you step back to take a photo. Attractions nearby include the Volkstheater, the Museumsquartier, the Spittelberg, the Naturhistorisches and Kunsthistorisches Museum, the Houses of Parliament, the Volksgarten of the Hofburg, the Rathaus City Hall and the Burgtheater. As you see, the Justizpalast occupies a very central and well-connected site.